Is Nike Finally Releasing the Shoes Marty McFly Wore in Back to the Future? OH MY GOD. I've waited my entire life for this. 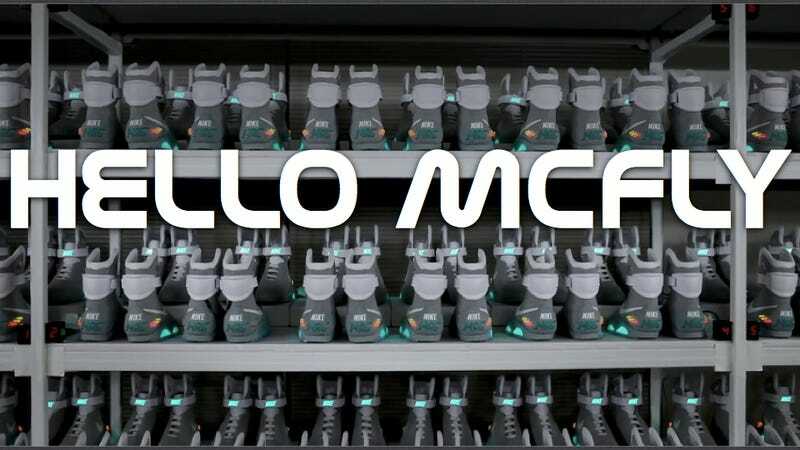 The guys over at NiceKicks think Nike will announce the Nike Air Mag tomorrow. The Nike Air Mag, as you may know, is the shoe that Marty McFly wore in Back to the Future II. The dots are connecting: we've seen a patent that Nike filed for auto-lacing shoes before, there's a teaser video floating around showing Marty McFly's closet (chock full of Air Mags, natch) and the invitation NiceKicks received from Nike show the metal glasses Doc Brown famously wore in BTTF II. We've seen Nike do BTTF-inspired stuff before (a DeLorean dunk, for example) but this would be the holiest of holy grails.